This is one in a series of blog posts accompanying Paper Is Part of the Picture: Strathmore Paper and the Evolution of American Graphic Design 1892–2017, an exhibition that I have curated at The Opalka Gallery of The Sage Colleges in Albany, New York. The exhibition runs from October 3 to December 15, 2017. 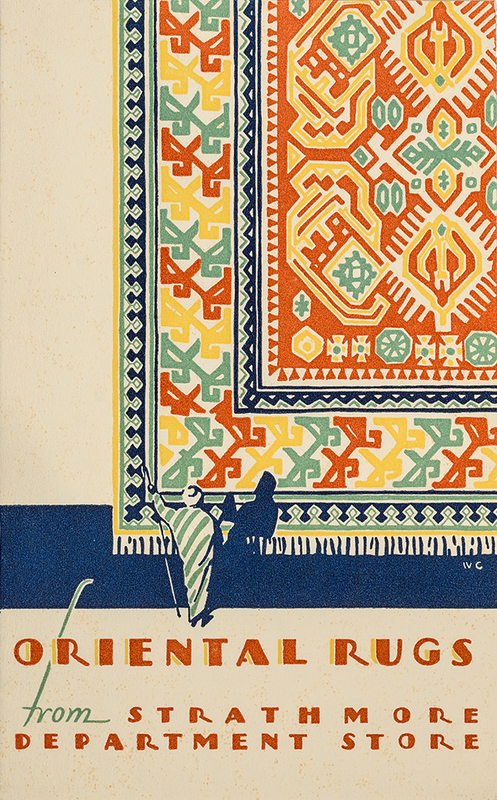 “Oriental Rugs from Strathmore Department Store” insert from New Ideas for Distinguished Advertising from Strathmore Town portfolio (Strathmore Paper Co., c.1927). Illustration signed W.C. (Walter Cole?). Photograph by Vincent Giordano. In the 1920s artists and designers experimented wildly with thistle designs as Strathmore marks. Many were silhouetted and stylized. Some were distorted to fit a predetermined shape or made to frame an illustration or text block. And some were ingeniously hidden in illustrations, such as the endpapers of Cockatoo (1927) by Edward A. Wilson (1886–1970) where the thistle only appears as a shadow at the bottom left. Walter Dorwin Teague (1883–1960) worked the thistle into a landscape on the cover of the Strathmore Deckle Edge (1923) sample book. For the color plates of A Grammar of Color Rudolph Ruzicka (1882–1978) created a set of decorative cartouches, each with a different stylized thistle, as titles for the different paper specimens. 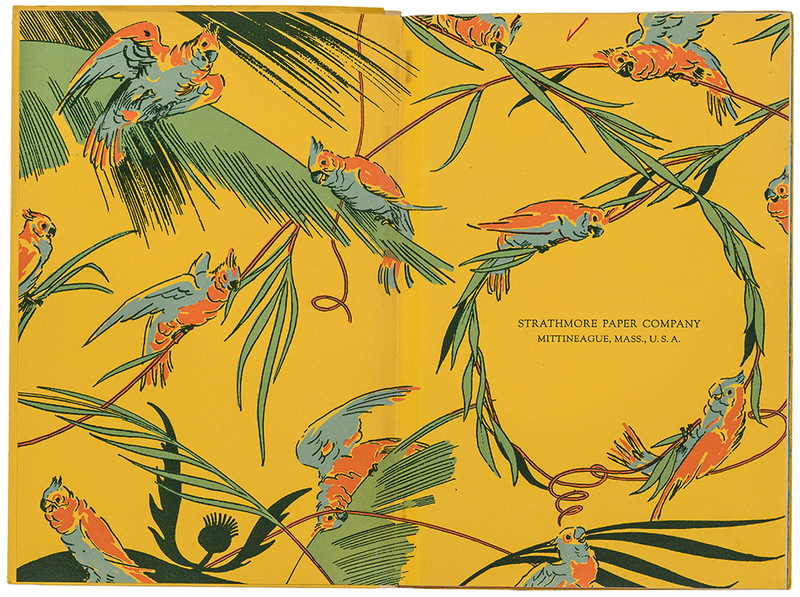 Endpapers from Cockatoo sample book (Strathmore Paper Co., 1927). Illustration by Edward A. Wilson. Photograph by Vincent Giordano. 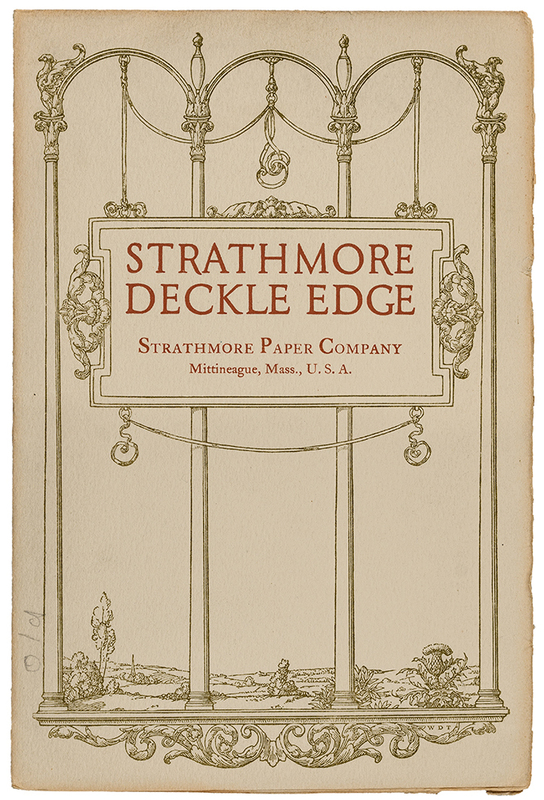 Strathmore Deckle Edge sample book (Strathmore Paper Co., 1923). Design by Walter Dorwin Teague. Photograph by Vincent Giordano. Despite the emphasis on illustrated paper sample covers in the 1930s, only two swatch books included thistles (and one of those was a reprise by Ruzicka of one of his designs for the color grammar). On the other hand, experiments with the thistle as a mark continued apace with some moderne versions being created by Charles Capon toward the end of the decade for The Strathmore Handbook (1938 and 1939) and for the Strathmore Staple Papers (1939) binder. 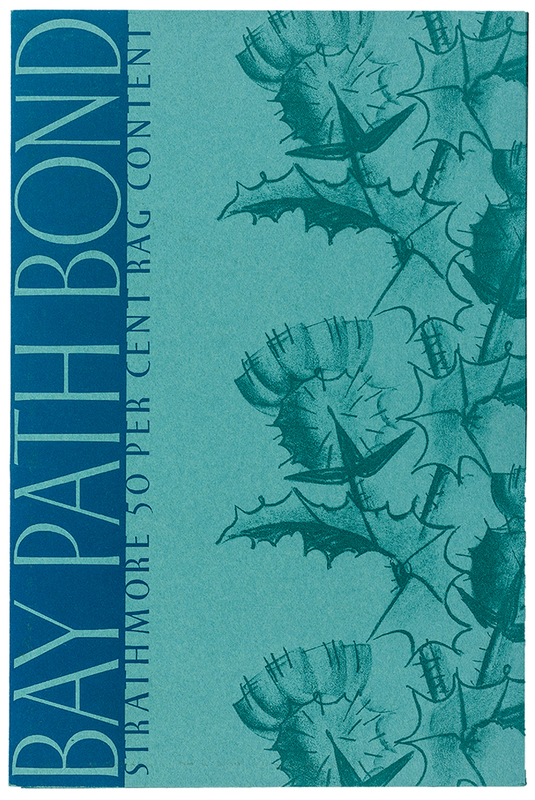 Bay Path Bond swatch book (Strathmore Paper Co., c.1931). Designer unknown (possibly Charles Capon). Photograph by Vincent Giordano. 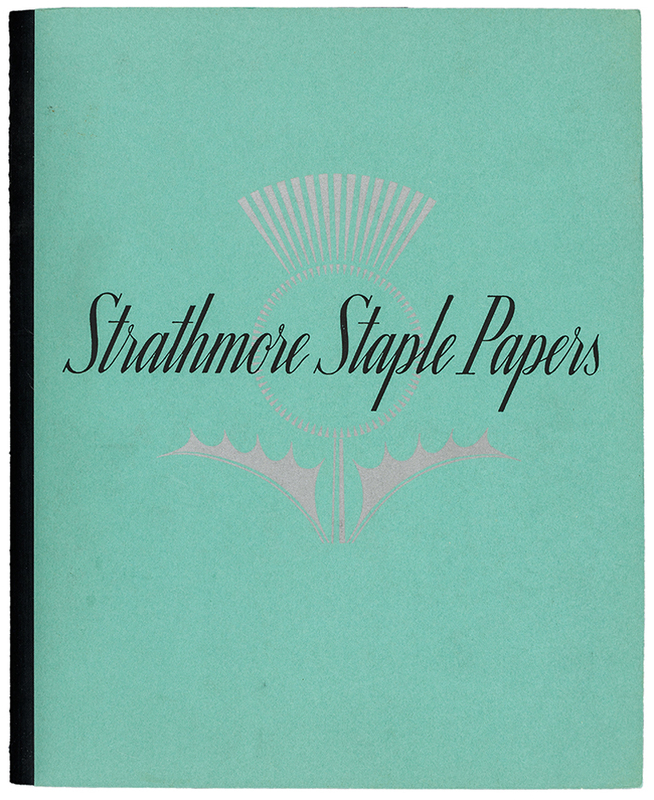 Strathmore Staple Papers binder (Strathmore Paper Co., 1939). Design by Charles Capon. Photograph by Vincent Giordano. The decline of the thistle in the 1930s was a harbinger of things to come for the beloved Strathmore mark.